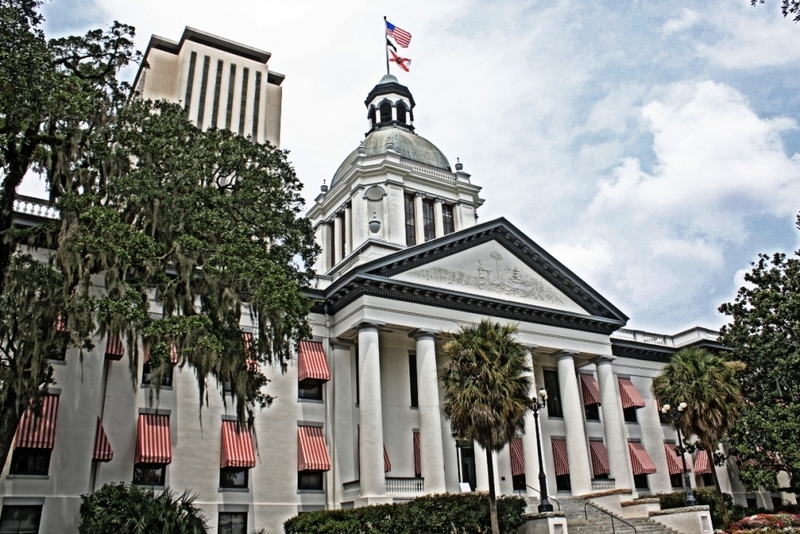 Florida became a state March 3, 1845, the 27th state admitted to the Union. At the top of Tallahassee’s second highest hill, the modern new 22-story capitol towers above the city. There is a fine view from the observation tower. The historic Old Capitol has been restored to its previous grandeur and is open for tours also. During the Civil War, Tallahassee was the only Confederate capital not captured by Union forces. Today Tallahassee retains the grace of its plantation days, although strongly oriented towards state and local government. Florida State University is here, with a 400-acre campus. The Flying High Circus, composed of Florida State students, performs for the city each spring before summering at Callaway Gardens. Hernando de Soto came by here in 1539, visit San Marcos de Apalache Historic Site; also visit St Marks National Wildlife Refuge, heavily populated with birds, deer, alligators and waterfowl in fall and winter. The moss-draped curving live-oak trees, the softness of the atmosphere, the cozy feel of a well-loved college town, the high white modern capitol that still preserved the old, the downtown walking space, the touch of Spain. Mountains near: Red Hills. Britton Hill in the northern part of the panhandle is the highest point in Florida at 345 feet.